If you’re in Mumbai, colonial heritage is something you really wouldn’t want to miss. Any architectural voyage across the city isn’t complete if you don’t witness the magnificence of Victoria Terminus (now known as Chhatrapati Shivaji Terminus), a historic railway station in the economic capital of the nation. Inspired by St. Pancras Station in London, the monumental structure was recognized as a World Heritage Site by the UNSECO back in 2004. 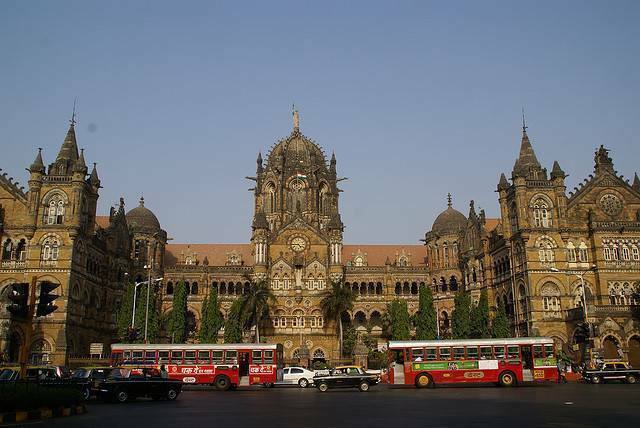 And for 128 years it has been an eternal source of inspiration for inexorable travelers, inventive artists and even to unobservant daily commuters and has become Mumbai’s most photographed working building. One of the oldest and busiest stations of India, VT has a vast network of suburban as well as long distance trains across the country. Victoria Terminus is headquarters of central railways. Built in a Gothic style with brass, iron and wood carved features plus a Queen Victoria. A brilliant illustration of the Victorian Gothic Architecture Revival, Victoria Terminus is impeccably blended with traditional Indian style construction. Its perfect domes, rising towers and the marvelous embellishment of wooden carvings, tiles, intricate railings and splendid staircases on the inside truly symbolizes the phenomenon, creativity and robustness of the 19th century architecture. This centerpiece has to be on every explorer’s list, as its splendor is something which truly deserves to be savored.